[ENG] Community blog: Do You Want to Change the Future? The thing I love the most about The Sims 3 Into the Future is that you can leave your mark on the future whether it is on a personal level or a grander scale. From influencing your family’s future lineage to manipulating the threads of time to create a happier or dirtier Oasis Landing, there are various ways for your Sim to have an impact. While experimenting with these changes, be sure to check out the Almanac of Time as it is a handy guide to all the impacts you can have on the future! One way to affect the legacy of your Sims is through their descendants. Your Sims can actively change who their descendants will be, what they’ll be like, how many there will be, and even what kind of lifestyle they’ll have. Sometimes it’ll take a big change like winning the lottery to affect the descendants, but don’t be surprised if even something small will alter your descendants! Things like getting married, having children, dying, buying real estate, and traits can all influence your descendants. I love constantly modifying my Sims’ lives to shape and reshape their descendants, but don’t get too caught up and forget to visit them and say hello! Again, the Almanac of Time is a great resource for information on descendants and will even help you locate them in Oasis Landing! 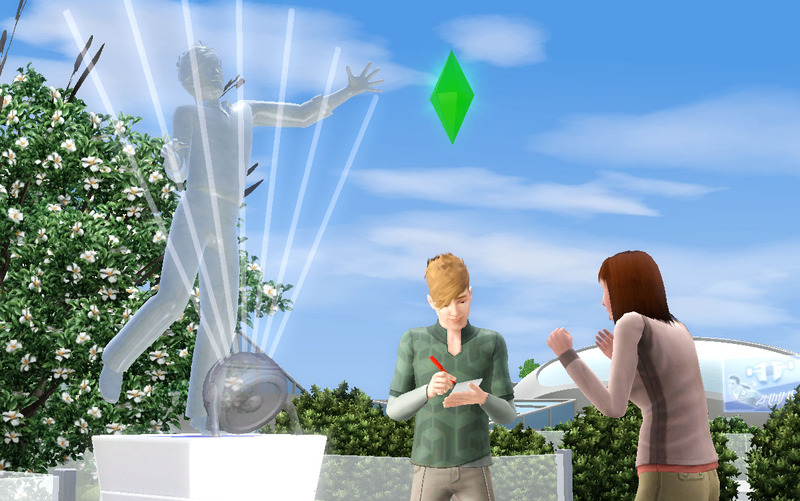 If your Sim is more interested in becoming famous in Oasis Landing, then he should try to achieve a Legacy Statue. 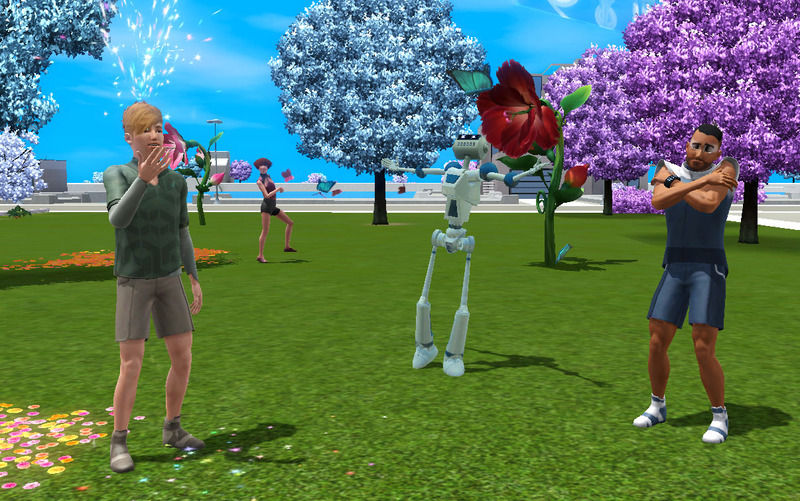 There are five different Legacy Statues that recognize specific Sims for their contributions in shaping the future! You can earn one of these statues for yourself by performing specific tasks in the present day. After you’ve successfully accomplished this then the next time you visit Oasis Landing go check out that particular Legacy Statue and you might notice the statue now looks like your Sim! The Almanac of Time shows how achieve each statue and the associated unique reward. But if your Sim wants to go big, then what could be grander than influencing the state of Oasis Landing for everyone!? There are two directions that you can help push the future towards: Utopian Oasis Landing and a Dystopian Oasis Landing. Once you’ve started to understand the future’s advanced technology a little bit better, you’ll be able to talk to the Time Traveler about changing the future and he’ll help guide you through the steps to affecting the future! You can’t expect to change the future without a little work. Don’t be surprised if you have to spend some time doing things like measuring cheerfulness or convincing other Sims that the sky is falling in order to set the present on a path of change. If you decided to alter the future in a positive way, you will find Oasis Landing different than before! 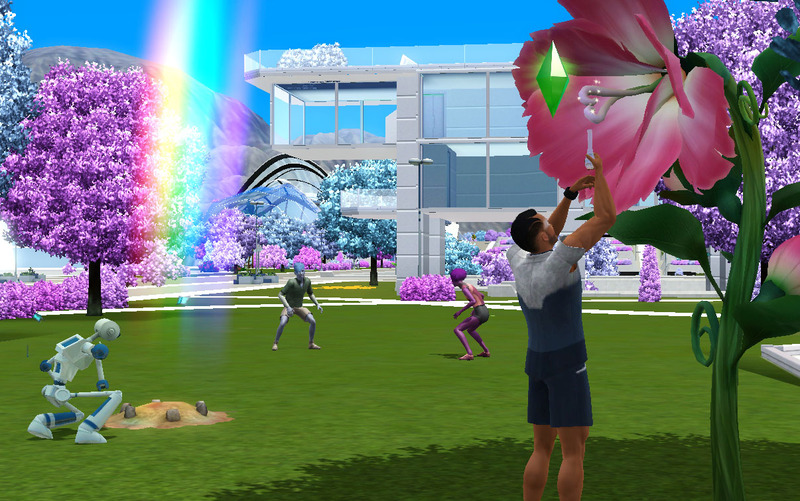 In this utopian flavored Oasis Landing, your Sim will quickly notice the colorful trees, delightfully oversized flowers, rainbows, and the visibly happy residents! The residents walk with a carefree spring in their steps, and enjoy dancing with themselves and hugging each other. Their whimsical happiness is contagious and if your Sims gets inspired by this wonderland then they might notice they too can inspire other Sims to dance and hug. There is plenty to do in this utopian world! The delightfully oversized flowers are not only pretty to look at, but you can also shake them to harvest dew. Throw dew at other Sims, or even yourself, to change their hair and skin color. You can also blow dew bubbles and have dew fights. If your Sims needs some quality alone time then they should go fishing. It’s no secret that I have an inexplicable fondness for snails, so if you do too then you might catch your very own Rainbow Snail by fishing while you’re here! And as your Sim is wandering out and about, he might just stumble upon a Rainbow Knoll, and if they’re lucky enough then they might find a Pot of Gold. So go exploring and enjoy Utopian Oasis Landing! If you went the dystopian route then you will find Oasis Landing littered with not only trash piles, but with danger and the unexpected! Meteors falling from the sky, and geyser rifts cropped up all over the world! These geyser rifts are Designer Chris’ favorite part of the dystopia! If your Sim is feeling brave then she can jump into a geyser rift and do some exploring. Who knows what might happen to her while she is down in the ground! Maybe she’ll find a collectable, become a lightning magnet, start glowing green, or some other unexpected consequence! Bugs! You heard that right! With all the bugs crawling around, the Sims decided to give them a little nibble and to their surprise found them satisfyingly scrumptious. Now your Sims can learn from their example and become a bug eating connoisseur! Your Sims might not like eating bugs right away, but once they become more comfortable eating these creepy-crawlies they’ll start to offer bugs to other Sims to eat. My favorite part is that once your Sims is scarfing down bugs like it’s no big deal, they can eat bugs no matter what world they’re in! So if my Sim is feeling a little hungry and is closer to the great outdoors then the nearest café then she can simply look for a bug on the ground. Super convenient! If, after all this experimentation your Sim just wants to get back to the normal Oasis Landing, don’t worry! At any point if you don’t like what you’ve done to the future you can always change it back to its normal state. Travel back to the present and ask the Time Traveler for his help with repairing the future and the future will be back to normal before you know it! 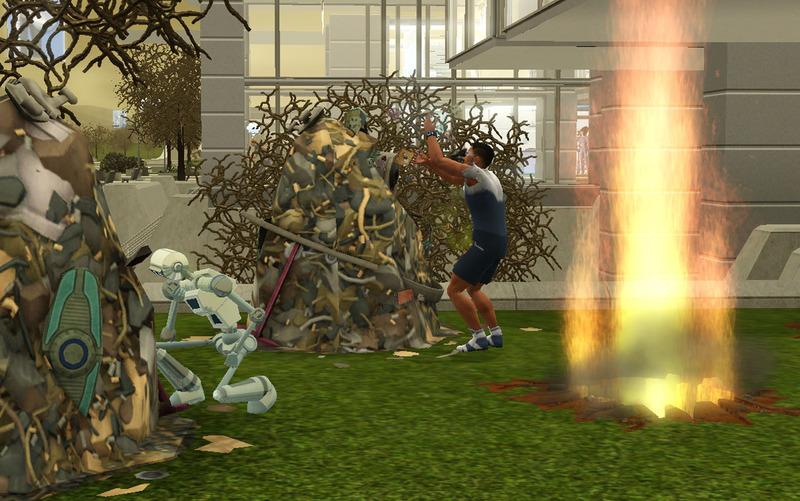 I can’t wait until everyone can check out all the fun things you can change and alter in The Sims 3 Into the Future!